Making clothes for yourself can be incredibly rewarding, but can come with challenges when trying to fit your body. Join Lindsey Rae of Sew To Grow as she teaches you step by step how to make perfectly fitting clothes for your shape. The Aeroplane bag is a crucial travel sack perfect for a weekend getaway. Available in two sizes, you will be able to pack a few days worth of clothing and essentials inside. Wanda loves this pattern and can?t wait to give you helpful tips and tricks about the ins and outs of this duffle. Spend a few hours with Jill and you'll have a sheet or two ready to give to that special little one. Learn the basic hand embroidery stitches! Are you interested in bag making and want to give it a try? Join Jill as she shares all her tips and tricks to help you create this stylish tote! With two size options, there are many ways to personalize this pattern. Use our waxed canvas or tea toweling for an unexpected twist! This laptop bag is perfect for sewers that are always on the go! The bag is padded with 1/2? foam on the front, back, and bottom for maximum protection of your electronic device. There is also an exterior and interior zippered pocket. The interior is separated with a divider, so you have room for both your laptop and charger. What a great way to carry your laptop around in style! Wouldn?t it be lovely to sew a dress for the special little girl in your life? The Lucy Dress is a sweet and extremely adaptable dress with two views. This easy- to-make lined jumper or sundress buttons on the shoulder and features an optional ruffle and piping in contrasting fabric. We can guarantee that you will make this over and over again, so join Chris as she walks you through this dress. Have you heard? Rope bowls are all the rage right now. Link up with Andrea to learn how to make a scrappy rope bowl or basket using Fran's cotton braiding. Expect to make a couple! This convenient zip up gizmo case stores and carries rotary cutters, scissors and sew many other sewing supplies. If you took Wanda?s Running With Scissors class, you?ll fall in love with this companion pattern! This stand up tote has two sizes to choose from, as well as a zippered top that opens wide for easy access. This tote also features a detachable carrying strap and plenty of room for your supplies. Sharpen your bag making skills and join Wanda as she helps you create the tote of your dreams! Use your embroidery machine to create all over quilting that looks like it was done on a long arm machine. Let?s get together and learn how to use those Accuquilt cubes. Join Chris and learn how to create this paper pieced beach house quilt using your favorite coastal fabrics. Embellish it to make it your own by adding embroidered flowers, fish in the ocean, shells on the sand, novelty buttons -- your imagination is the only limit! In making this lap size quilt you will learn cutting, piecing, adding a border, layering, quilting and binding. Take a photo and turn it into a quilt! Join Fran in this fusible applique block of the month program starting in January where you will meet monthly to develop your green thumb. Join Chris to try several methods of machine quilting including stitch in the ditch grid sewing free motion and stippling. Chris will share products and techniques to make machine quilting easier. Do you have limited space to quilt? If so, this new method is for you. 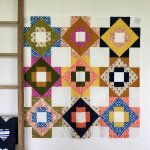 Explore an easy way to quilt even the largest quilt by quilting each block individually before attaching it to the rest of your quilt; no more wrangling a huge quilt with a limited space to sew, YAY! Aren't swans the universal mascot for love? Want to see if you like quilting? This class is a small investment in time and material yet you learn all the basics for quilting: how to cut, piece, sandwich, quilt and bind a quilt. So, don't be afraid to give it a TRY! Explore new techniques using your Brother Scan-N-Cut by working with fabric, vinyl, cardstock and so much more. $40 ($15 class price when your Scan-N-Cut is purchased at Fran's. Join Debbie and bring your Scan N Cut and laptop to explore new techniques with fabric and more. Learn to get the most from your machine and mats. One free class with purchase of Scan N Cut from Fran's; after first free class, $15 price on following classes. This class is DX models ONLY. Get to know your serger, how to thread, adjust tension, length, gathering and more.